Although the MPL Processor boards are traditionally equipped quite well, special interfaces like A/D converters are almost always required in industrial applications. 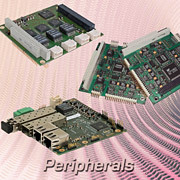 Therefore, we provide you with a selection of peripheral cards to extend the capabilities of the MPL processor boards. If you can't find the interface you need for your application, you also can use PC/104 and PC/104-Plus boards from other manufacturers.